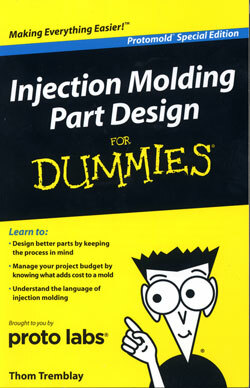 Proto Labs has released a book “Injection Molding for Dummies,” written by Tom Tremblay. The group worked with the “For Dummies” people at Wiley & Sons Inc. to create an easy-to-understand guide to the injection molding process. And it pays off. Is it everything you ever wanted to know about injection molding? Actually, yes, depending on your job description. The book provides a very thorough overview of the process designed to help medical device designers, for example, get enough information about the process to help them talk to molders intelligently. Proto Labs provides CNC machined and injection molded parts. Its Firstcut and Protomold services use proprietary computing technologies and automated manufacturing systems to provide prototypes and short-run production parts. The book addresses the basics of molding, how to overcome common challenges, such as warping, design limitations, and materials selection. Particularly useful is the vocabulary discussion. If you don’t know what a boss or a rib might be, this is the book for you. I found chapter four, which describes the complex side of injection molding, the most informative—likely becuase I hadn't learned about some of the technologies prior to reading the book. This section discusses when to use side-action cams or shutoff molds. The writing style is casual and direct, with some amusing metaphors and useful examples. One I liked was using model car parts, which most kids have seen, to illustrate what a gate looks like. At 66 pages, the book is a quick read. Chapters are short, the illustrations useful, and the inevitable promotional content is kept to a minimum. I’m fairly certain that after reading this book that I can now design parts for an injection mold. And from a non-engineer, that’s pretty high praise.